Adnan Alahmad left war-torn Aleppo, Syria, with his wife, two adult children and seven hundred paintings by the best of Syrian's artists. Their journey took them to Lebanon, and Mersin, Turkey, before arriving in Istanbul last summer. I met him and his family at the "Syrian Plastik Arts" exhibition at the Marmara University campus in Sultanahmet, Istanbul, just beside the Blue Mosque. The show aimed to introduce contemporary Syrian artwork to Turkish art lovers and tourists, as well as to support artists inside war-torn Syria and those now living in other countries. "We left a thousand paintings behind." The pain in Adnan's eyes spoke volumes. For twenty years he had built a life around his gallery in Syria, where he also encouraged and developed young talent through an organization called Fine Vision. But, his art show in Istanbul drew few visitors. His daughter Zain Alahmad is a painter who had two pieces in the exhibition. 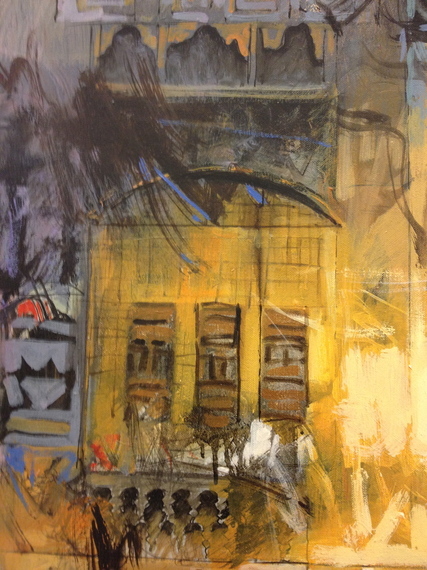 Both depicted a charred Aleppo cityscape with bold black strokes on lengthy white and brown canvases. She holds a fine arts degree from Aleppo University and had been teaching art before having to leave her home. Adnan's son Ahmad Karam Alamad is studying Turkish and hoping to continue his studies in computer science while in Istanbul. His wife Aruoba Moubayed Alamad, whom Adnan met while the two of them attended law school at Aleppo University, had been his partner in their former gallery as well as a practicing attorney. "We shared a big love story," he said, causing his wife to smile. Only minutes before she had broken into tears when gazing at one of the paintings. "When not in school, our children spent their time in the gallery doing homework, drawing, or playing with friends, surrounded by works of art." Adnan has written about and even financed the publication of books by and about many of Syria's prominent artists and writers: Dr. Abdul-Salam Ojelili, a doctor of medicine and novelist; Dr. Shahla Al Ojaili who is now working in Jordan as a professor of Arab Literature; Saad Yagan, one of whose pieces in the show depicts a couple who might have been dressed in their pajamas, clutching each other in the night, beneath blackened trees beside a sea; and the e poet Adonis Ali Mokawas. Adnan Alamad hopes "to continue to gain exposure for all Syrian artists and help them sell their work." Many of them are now living elsewhere in the region as well as Austria, France, Germany and New York, where, Adnan says, "their art is better understood." To this end Adnan has set up a virtual gallery on Facebook. 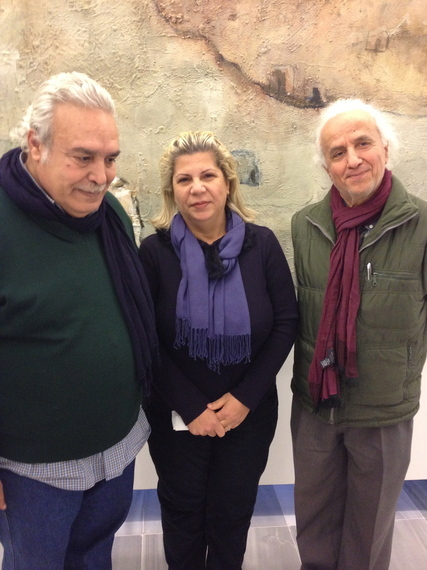 Adnan and his Turkish colleague Husayin Emiroglu, the artist who curated this exhibition at Marmara University, explained that the attendance was low for this first showing of Syrian artists in Istanbul. Only about one hundred people and two television stations, TRT Arabic TV and the AA Turkish government agency, came to the opening reception. Emiroglu said that the media in Turkey doesn't cover art and culture much. "I tried to rectify this in a column I wrote for a city newspaper for four years before I was given the boot," he said, making a gesture with his foot as having been kicked out the door. Apparently his discussions became too critical of what he perceived as problems in Istanbul in general. While every painting in this exhibition could be called captivating, gripping and disturbing, two artists stood out. Farouk Mohammad's series When I Was a Child are images mostly of sand and structures made of sand, derived, the artist said,"from the nature of his sentimental archive." He grew up in a Syrian Kurdish village and now lives in Austria. Naser Nasan Agha is from Aleppo. He arrived recently in Istanbul with his art supplies in hand and began working right away to help hasten his adjustment to his new environment. "Painting is what I do." He hopes that future exhibitions of Syrian artists will be better attended, once the word gets out. 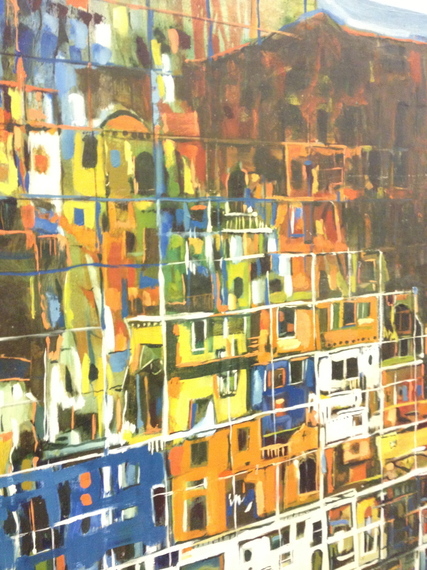 Several of his paintings were abstract images of Aleppo under siege. A detail of one is shown at the beginning of this article. Adnan talked about two of the artists in the exhibition. He chose a woman Iman Hasbani who championed women's issues. This artist, now living in Beruit, also works with video arts. She feels many Arabic men have closed minds about women and her work aims to raise awareness through uncomfortable images of women. The painting below of the red haired woman in a green suit, beside which Adnan is standing, is one such painting. Adnan spoke about Mohammad Al Wahibi with whom Adnan spent a month in the village of Ma'loula, a mountainous desert village about an hour north of Damascus. It is a place that is important to Damascene artists because the pristine landscape and the people living there who espouse a more "Sufi outlook on life," are inspirations, Adnan said. "They are all the time with God. In Ma'loula there are open minds." There is a Greek-Orthodox church, a Greek-Catholic monastery and a Muslim community in the village. Aramaic is still spoken there, a dialect used by Bedouin across Syria, which is the language Christ spoke. The people celebrate the Prophet Muhammad's birthday, peace be upon him, with rock music and a feast. Women covered with headscarves and other forms of hijab greeted travelers warmly. Sadly in 2013 Syrian rebel forces took control of the town, kidnapping 12 nuns from St. Thecla's Monastery. Wahibi's work from Ma'loula is an exploration of, What is the meaning of Ma'loula? Some paintings evoke a mystical quality. Perhaps they could also be described as part dystopian, part fantasy. Adnan Alahmad and his wife hopes the future includes an end to the misery in the region, though meanwhile they will continue to support Syrian artists among the diaspora and those still inside their war-ravaged country. But most pressing, Adnan would like to sell some of the seven hundred paintings, not only to benefit the artists, but to create more space in his home. "We have two rooms in our apartment: one for my grown children, the other for me and my wife and 700 paintings." "Syrian Plastik Arts," was curated by Huseyin Emiroglu and the Erguvan Istanbul Dernegi Society, an artistic and culturally minded group that plants Erguvan (cherry trees) around the city every year. The Erguvan Society also holds an annual arts exhibit every spring that is open to artists of all nationalities. The stipulation is each piece must feature an Erguvan, Cherry, Saku or related tree.